Holmes, an American, beat the much-fancied favourite Hilary Mantel whose Bring Up The Bones has already taken out two of the trifecta of major prizes, the Man Booker and the Costa. 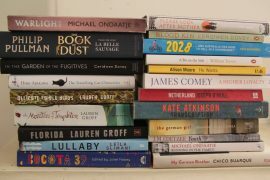 Other finalists for the £30,000 prize were Zadie Smith’s NW, Kate Atkinson’s Life After Life, Barbara Kingsolver’s Flight Behaviour and Maria Semple’s Where’d You Go, Bernadette. Following the decision by Orange to end its sponsorship of the prize, this year’s competition was financed by supporters including Cherie Booth, wife of the former Prime Minister, and author Joanna Trollope. However, next year it will be known as the Baileys Women’s Prize for Fiction after the maker of the creamily-smooth liqueur (particularly popular at Hen’s nights and Christmas parties) stepped into the breach.